Having hunted all the big supermarkets for a red cabbage, I finally found one in the small fruit and veg shop at the top of the road! Why do I need a vegetable which is called red and is in fact purple in colour? I want to do some experimenting with keen and brave volunteers to answer that very question! However for those who just can’t wait.. I will let you into the secret now… red cabbages contain a class of pigments called anthocyanins; this pigment is also found in the skin of red apples, grapes, plums and is the pigment in leaves which turn them red in the autumn. Nature uses colour in a variety of ways. In animals, colour camouflages – in plants the opposite is more common. Colour in flowers, for example, attracts insects to pollinate the flower. The pigment found in red cabbage is seen to be pink or red colour in acids, a purplish colour in neutral solutions and appears blue, bluish green, green or yellow in alkalis, depending on the pH of the solutions. How is this possible? The colour of the juice changes in response to its H+ ion concentration. Acids donate H+ ions in aqueous solutions and have low pH values. Bases in aqueous solutions (alkalis) however accept H+ ions and have pH values higher than 7. As the pH of the cabbage indicator gets higher there is a loss of H+ ions. This loss alters the wavelengths of the light reflected by the anthocyanin pigments in the indicator, thus creating the varying colour range with respect to pH. Click on the image to see the full range. We see colour due to sensors in the retina of the eye called rods and cones. The rods are sensitive to low light and the cones, which require a greater intensity of light, are sensitive to colour. These sensors pass on their activity as a message to the brain via the optic nerve. 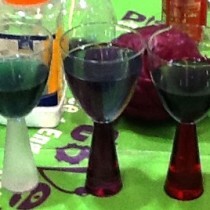 When we add vinegar to the purple cabbage juice we see the colour red. The rods and cones of our eyes pick up this particular wavelength or red because at this concentration the cabbage pigments reflect light rays from the red end of the spectrum and absorb light rays from the blue end. Quite a lot of foods are preserved in vinegar, in the supermarket you will find a range of foods pickled in vinegar from eggs to onions, it is because of this pickling process we call a cabbage which is purple in colour a ‘red’ cabbage! Come to the Balmoral Show, Lisburn http://www.balmoralshow.co.uk/best-dressed.html and visit zone 2 to see Scientific Sue perform her Supermarket Science Shows and find out what happens when these wonderfully coloured solutions are mixed and much much more.